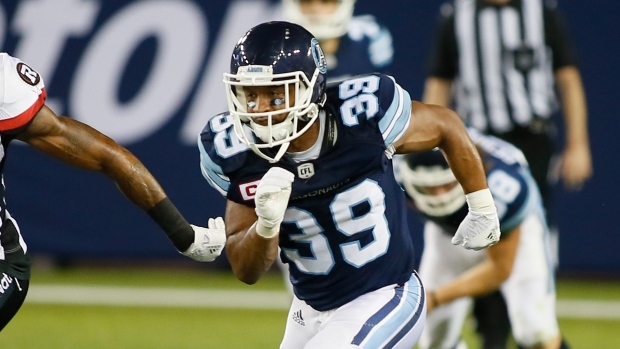 TORONTO — The Toronto Argonauts re-signed Canadian defensive back Matt Black on Monday. Black, 32, was released by Toronto last week and hasn't played in a game yet this season. The nine-year CFL veteran has played in 109 games for the Argos since being selected by them in the sixth round of the 2008 draft. Black has 128 defensive tackles, 80 special teams tackles, three interceptions, two sacks and two forced fumbles over the course of his career. The five-foot-nine, 192-pound Toronto native has also appeared in six playoff games with the Argonauts, winning a Grey Cup in 2012 and registering one defensive tackle, five special teams tackles, a forced fumble and a fumble recovery. The Argos also added defensive lineman Linden Gaydosh to their practice roster.